Warm, dark violin sunburst and white body binding add visual charm to this sharp sounding 12-string. 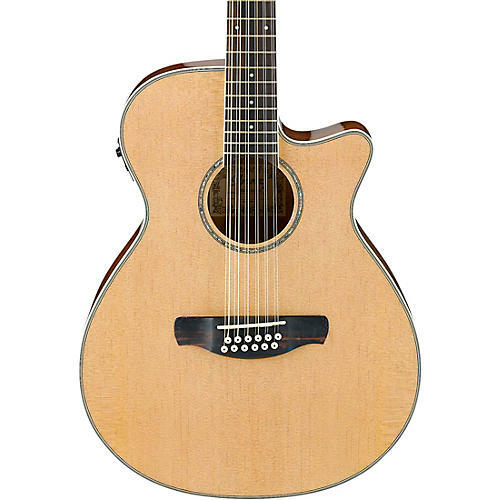 The AEG1812IINT acoustic-electric is a stage-ready guitar designed specifically with the electric player in mind. With a thinner body and shorter 24.9" scale length, the AEG is designed to put the electric guitarist at ease with a feel and playability less acoustic and more reminiscent an electric instrument. Built for comfort and speed, the AEG1812IINT features the feedback-killing thinner profile AEG body. The spruce top, sapele back and sides, and a purpleheart fretboard provide a lively sonic response even without amplification. A Fishman Sonicore pickup with an AEQ-SP2 preamp delivers a sweet cascade of amplified acoustic tones for the stage, and an onboard tuner provides quick, discreet tuning. Other features include chrome die-cast tuners, a beautiful abalone rosette and a natural high gloss finish.